It is difficult to keep a group moving forward, whether it is a class, church group, civic organization, support system, or any other sort of group. But recently I read some advice on how to keep a group together and active. First, practice gratitude when you are together. People are inclined to notice when thing go wrong more often than when they go right. Leaders can shift this paradigm by catching people doing things right and thanking them on the spot. Immediate and specific feedback create a nurturing environment in which people thrive, because prompt, affirmative reinforcement increases positive behavior and motivation – people do more of what they are thanked for. This is why genuine praise is one of the best parenting, relationship and management techniques available. Second, actively encourage kindness. As we give our random acts of kindness, we feel a deep level of contentment that keeps our brains in positive mode. Kind acts also deepen social connection, a key indicator of happiness. Third, don’t forget to move. Our physiology directly affects our psychology. Frequent movement is beneficial for both bodies and brains, improving creativity, focus and efficiency. Exercise augments neurotransmitters in the brain, increasing both short and long – term happiness. Fourth, recharge in rhythm. Learn how to tune in to internal body – clock rhythms and pay attention when it’s time to take a break – when you become distracted, tired, thirsty, hungry, fidgety or frustrated. It is possible to ignore these signals, say if you have a report deadline looming and just doesn’t want to stop; your body will go into fight or flight mode, pushing through with a burst of adrenaline. This is acceptable from time to time, but if you continue this practice day in and day out, you will reach a chronic state of stress, which has serious health consequences. 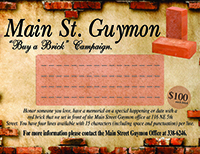 Main Street Guymon has two fabulous events happening on Sun., Oct. 14. The first is the Anthropology Lecture by Dr. David Mains of the University of Oklahoma on “Learning about Ethiopian and Eritrean Cultures.” There will be Ethiopian coffee served by K2 Coffee in Gruver, Tex., and Neima Adem will be bringing some Ethiopian snack to try. This all takes place from 2 – 3 pm at the Guymon Public Library, 1718 N. Oklahoma Street (enter at the side door). The event is free to all. The Special Game Day, a baseball game for families with someone who has special needs, is going to take place this year because of the weather in the Noble Center. It will be a Home Run Derby rather than a game, but it’s baseball fun at it’s best with the best baseball players ever – the Panhandle State Baseball team. The registration is at 3, with practice starting at 3:30, and a snack break at 4. Then at 4:30 the game begins and is followed by a Seaboard Foods hot dog dinner. All are invited to come and partake! Deirdre Harbison has started a Costume Closet for this Halloween. If you have an old costume that you no longer use and it is in good shape, call Harbison and that costume could provide the fun a kid needs for the holiday. Call Harbison at 580-754-5623. What a great idea! The Guymon High School Alma Folklorica Dance Group is hosting an Enchilada Dinner Fundraiser on Oct. 15 from 5:30 – 8 pm at the Guymon High School Commons. Tickets are $8 for an adult and $5 for a child 10 and under. The ticket includes your dinner plate and a live performance by the dancers. Mark the Texhoma Elementary Fall Festival on your calendar. It take place Nov. 3 from 5 to 8:30 pm and includes bingo for those who love the game! There are other fun games for kids. A great evening for the family. Lions Club members are selling peanuts. Call Charles at 580-206-0111 or John at 580-468-8611 if you want some! Be good, stay warm, and I’ll see you on the bricks!